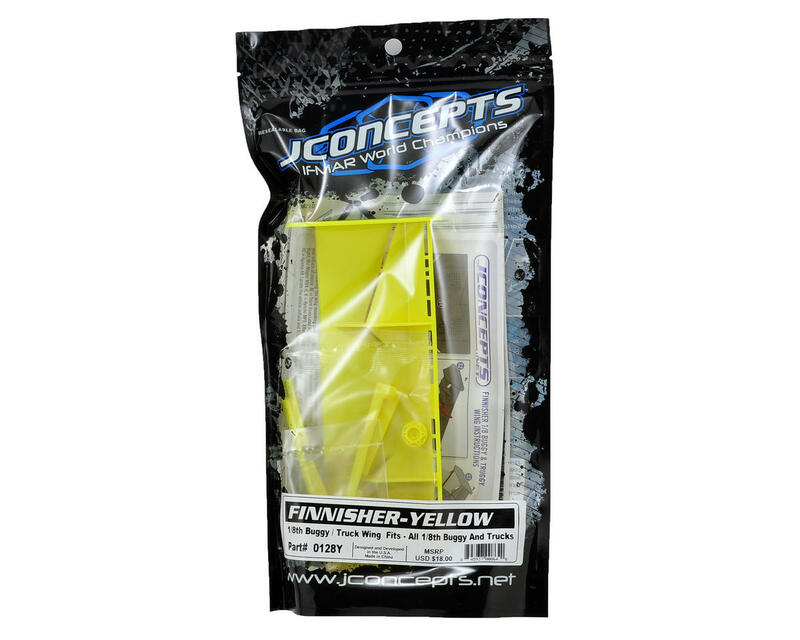 This is the JConcepts "Finnisher" 1/8 Off Road Wing. Aerodynamics is a critical component of an 1/8th off-road vehicle. Vehicle type, body style and rear wing are all important factors that make up a complete aero package. JConcepts understands this, and regularly experiments with aero features throughout the entire product line, primarily bodies and wings. Starting in 2007 with the Illuzion HD wing, then following up with the Punisher wing in 2010, JConcepts had a selection of wings that would suit a variety of conditions, but they wanted to produce something special for the 2012 IFMAR World Championships. 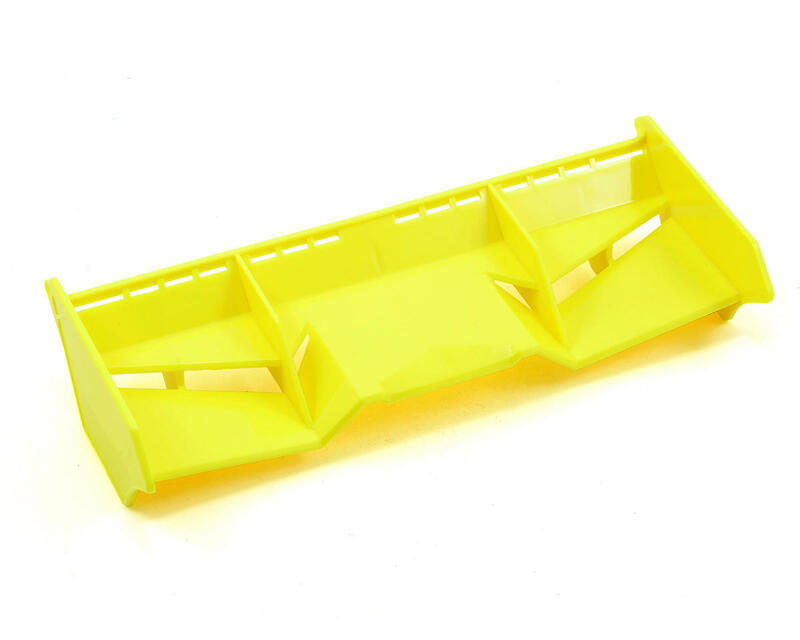 In colaboration with their pro racing team of drivers, JConcepts developed a high-performance, adjustable rear wing for 1/8th racing they dubbed "Finnisher". The Finnisher Wing features a high-attack, V-angle design with adjustable gurney and winglet options. A radical and edgy, yet functional design compliments the Finnisher and Silencer series of bodies, the Finnisher wing includes elements and features never seen before in 1/8th Off-Road! The wing can be run stock with a small winglet which provides some edge stability and light deflection, while the optional gurney or winglet is easily added to the wing with one simple 3x8mm screw. The included 2-piece gurney slides in through the bottom on both sides adding that small vertical wall at the rear, providing that last bit of tuning ability on dusty and low grip conditions. The wing to vehicle attachment is made easy with included, screw-in type and body-clip type wing button choices adding security and additional detail. Top off the appearance of the Finnisher by applying the pre-cut decal wrap on each panel surface for the ultimate look and performance. The recessed side-dams, introduced by JConcepts, provide a great placement area for included decals. In addition, the wing includes one of a kind pre-dimpled markings for exact fit locations on 6 popular 1/8th buggies (Associated, TLR, Mugen, Kyosho, XRay and Agama). Simply find your vehicle of choice and ream the hole to vehicle fit specifications and the Finnisher is ready to hit the track. Finnish the competition with JConcepts.